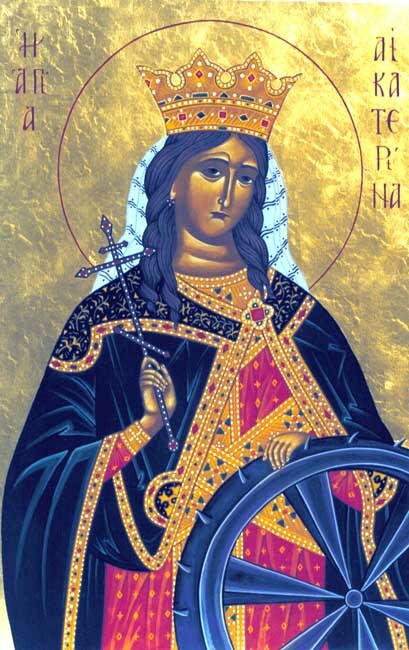 The Holy GreatMartyress Catherine was the daughter of the governor of Alexandrian Egypt Constus during the reign of the emperor Maximian (305-313). Living in the capital – the centre of Hellenistic knowledge, and possessed of an uncommon beauty and intellect, Catherine received a most splendid of educations, having studied the works of the finest philosophers and teachers of antiquity. Young men from the most worthy families of the empire sought the hand of the beautiful Catherine, but none of them was chosen. She declared to her parents that she would be agreeable to enter into marriage only with someone who surpassed her in illustriousness, wealth, comeliness and wisdom. Catherine's mother, a secret Christian, sent her for advice to her own spiritual father – a saintly elder pursuing prayerful deeds in solitude in a cave not far from the city. Having listened to Catherine, the elder said that he knew of a Youth, who surpassed her in everything, such that "His beauty was more radiant than the shining of the sun, His wisdom governed all creation, His riches were spread throughout all the world – this however did not diminish but rather added to the inexpressible loftiness of His lineage". The image of the Heavenly Bridegroom produced in the soul of the holy maiden an ardent desire to see Him. Truth, to which her soul yearned, revealed it to her. In parting, the elder handed Catherine an icon of the Mother of God with the God-Child Jesus on Her arm and bid her to pray with faith to the Queen of Heaven – the Mother of the Heavenly Bridegroom – for the bestowing of the vision of Her Son. Catherine prayed all night and was given to see the MostHoly Virgin, Who sent Her Divine Son to look upon the kneeling of Catherine before Them. But the Child turned His face away from her saying, that He was not able to look at her because she was ugly, of shabby lineage, beggarly and mindless like every person – not washed with the waters of holy Baptism and not sealed with the seal of the Holy Spirit. Catherine returned again to the elder deeply saddened. He lovingly received her, instructed her in the faith of Christ, admonished her to preserve her purity and integrity and to pray unceasingly; he then performed over her the mystery / sacrament of holy Baptism. And again Saint Catherine had a vision of the MostHoly Mother of God with Her Child. Now the Lord looked tenderly at her and gave her a ring – a wondrous gift of the Heavenly Bridegroom. At this time the emperor Maximian was himself in Alexandria for a pagan feastday. Because of this, the feast was especially splendid and crowded. The cries of the sacrificial animals, the smoke and the smell of the sacrifices, the endless blazing of fires, and the bustling crowds at the arenas filled Alexandria. Human victims also were brought – because they consigned to death in the fire the confessors in Christ, those not recanting from Him under torture. The Saint's love for the Christian martyrs and her fervent desire to lighten their fate impelled Catherine to go to the pagan head-priest and ruler of the empire, the emperor-persecutor Maximian. Introducing herself, the saint confessed her faith in the One True God and with wisdom denounced the errors of the pagans. The beauty of the maiden captivated the emperor. In order to convince her and show the superiourity of pagan wisdom, the emperor gave orders to gather 50 of the most learned men (rhetoricians) of the empire, but the Saint got the better of the wise men, such that they themselves came to believe in Christ. Saint Catherine shielded the martyrs with the sign of the cross, and they bravely accepted death for Christ and were burnt by order of the emperor. Maximian, no longer hoping to convince the saint, tried to entice her with the promise of riches and fame. Having received an angry refusal, the emperor gave orders to subject the saint to terrible tortures and then throw her in prison. The Empress Augusta, who had heard much about the saint, wanted to see her. Having prevailed upon the military-commander Porphyry to accompany her with a detachment of soldiers, Augusta went to the prison. The empress was impressed by the strong spirit of Saint Catherine, whose face glowed with Divine grace. The holy martyress explained the Christian teaching to the newly-arrived, and they in believing were converted to Christ. On the following day they again brought the martyress to the judgement court where, under the threat of being broken on the wheel, they urged that she recant from the Christian faith and offer sacrifice to the gods. The saint steadfastly confessed Christ and she herself approached the wheels; but an Angel smashed the instruments of execution, which broke up into pieces with many pagans passing nearby. Having beheld this wonder, the empress Augusta and the imperial courtier Porphyry with 200 soldiers confessed their faith in Christ in front of everyone, and they were beheaded. Maximian again tried to entice the holy martyress, proposing marriage to her, and again he received a refusal. Saint Catherine firmly confessed her fidelity to the Heavenly Bridegroom – Christ, and with a prayer to Him she herself put her head on the block under the sword of the executioner. The relics of Saint Catherine were taken by the Angels to Mount Sinai. In the VI Century, through a revelation, the venerable head and left hand of the holy martyress were found and transferred with honour to a newly-constructed church of the Sinai monastery, built by the holy emperor Justinian (527-565; Comm. 14 November).